Helfir is the solo project of Italian multi-instrumentalist and vocalist Luca Mazzotta, also known as frontman of the progressive death metal outfit Silvered. If that doesn’t ring a bell there’s a few more bands this man has participated in, about another dozen or so. Despite this Luca apparently never found enough space to fulfill all his musical wishes and dreams, because back in 2015 Luca decided to translate his innermost essence into music. This resulted in a dark, melancholic and at times ominous type of music, touching both rock and gothic metal fittingly called decadent noir metal in the style of heavyweights like Anathema and, more prominent, Antimatter. His debut called Still Bleeding was an album of high quality and skill, which I enjoyed very much, even though arguably the influence of Antimatter was perhaps a bit too obvious at times. Now, two years later, his latest work is about to see the light of day, on June the 30th The Human Defeat will be released. If anything I’m curious to hear if he has maintained the high standard of his previous release and whether and/or how he has grown and progressed into his decadent noir metal. The Human Defeat offers a 50-minute musical journey spread over 10 songs and straightaway it becomes clear Helfir has definitely evolved since its debut. Opener Time In Our Minds leaves no room for even the slightest doubt about this. At first the progression, or change if you will, isn’t all that obvious even though it has a heavy touch to it, but then out of the blue Luca bursts out in a grunt shattering every shadow of doubt you might still have. Being blessed with a widely ranged voice, allowing him to switch from emotional, sweet and soothing to aggressively harsh in a heartbeat, Luca manages to fully exploit the impact a weapon like this can have on a song. He weaves his vocal lines in the refined compositions that form the solid base of the songs on The Human Defeat. However, his vocal performance is not the only aspect of Helfir’s music that catches the ear, the music itself is of an equally high quality. Whether you focus on the guitar lines, the bass lines, the programmed drum section or the keyboard sections, it all feels equally solid and matches to the detail. There’s even room for a few guitar solos that, not surprising, are carefully composed and sculpted into the songs, giving, for example, Tide and Golden Tongue a great outro. Luca obviously has put a lot of thought in how he wants the world to experience his essence, guiding you through an ever-changing landscape of atmospheres. The ray of hope that seems to radiate from the whispers of the otherwise sad Light, the unexpected burst of aggression that smacks you in the face in the death metal influenced Mechanical God, the burdening sorrow that emanates from the depressing Chant d’automne (Autumn song, seemingly loosely based on the homonymous poem by Charles Beaudelaire), every song invokes a different atmosphere. This makes listening to this album an interesting adventure to say the least, one you’re not likely to forget soon. It’s safe to say Luca and thus Helfir shows great progress with The Human Defeat. 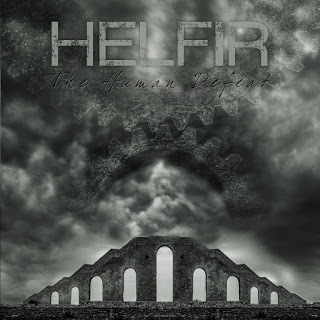 The fragility and tranquility, trademark of Helfir’s music on its first release, is still extensively present as it should be, but the scale unmistakably tips a bit more towards metal rather than towards rock on this release. The result is that the album is given a slightly more heavy feel to it, while staying true to the musical roots nevertheless. In my opinion that is a definite plus. Not only does Luca more or less cut himself loose from the at times too obvious connections to Antimatter and the likes, he also shows he is capable of composing songs in which originality is a contributing factor and on top of that he eliminates the risk of his songs and sound getting boring or cheesy. Of course the influence of the aforementioned bands remains, after all every song is influenced by other music to some extent, but it’s not as predominant anymore. All in all a very good release filled with an atmospheric, emotional and at times a bit rough-around-the-edges type of music that will remain part of my playlist for a long time I’m sure. You can also check our interview with Helfir here!